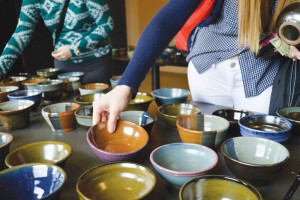 Wittenberg University hosted its twenty-second Empty Bowls on March 31 in order to raise money for Second Harvest Food Bank, a non-profit organization that redistributes food at a lower cost to programs that serve the needy. Since 1994, Wittenberg students, faculty and local artists have come together to create the ceramic bowls that are sold each year. 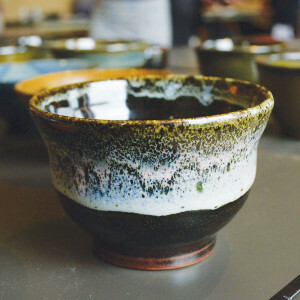 This year-long effort produces the 1,000 bowls that are sold at the event. For $15, one can pick out a unique bowl and test as many soups as he or she would like. 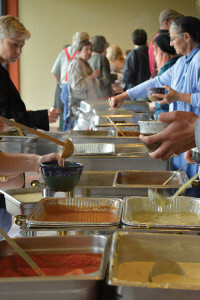 All the soups are donated from local restaurants, distributors and Sodexo for the event. In 2015, Wittenberg’s Empty Bowls raised $48,150 for the Second Harvest Food Bank, bringing the 21-year total to over $363,000. By purchasing just one bowl at Empty Bowls, one can provide 75 meals for those in need. Frequent donors are also recognized each year. Those who have been coming to the event since 1994 are awarded a wooden spoon for their continued donations. Additionally, frequent donors get to choose from a select set of bowls that are set aside before the event. Alena Mohler, class of 2015, said she has helped with the event by throwing and glazing bowls for the past five years. Scott Dooley, associate professor of art, department chair and faculty coordinator for Empty Bowls, works continuously with students to make sure all the bowls are completed in time. Throughout the year, he hosts 10 throwing days. These last for at least two hours on a Saturday or Sunday afternoon. Between five and 12 volunteer students and artists come in to help in the initial stages of making the bowls. They are then glazed at a later time to give each bowl a unique look. Dooley has been helping with Empty Bowls since he first came to Wittenberg in 2000, and he throws a significant amount of the bowls each year. With his help – and the help of student coordinator Kelli Harrod, ’16 – Empty Bowls continues to draw in large numbers each year. In many of the past years, all 1,000 bowls have been sold to members of the Clark County community and other neighboring counties. When the bowls have sold out, guests can still enjoy the unlimited local soups for $5, and can still participate in the raffles for bowls, vases, plates and more. Zara Tickner, ’18, said this was her second time attending Empty Bowls, and that she enjoys going to pick out her bowl and try the soups from local restaurants, especially since her donation goes to a local charity.